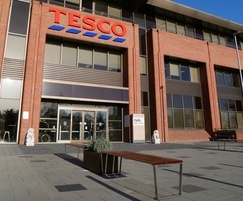 Shire Park in Welwyn Garden City is home to a number of multi-national businesses, and is the head office location of Tesco PLC, who occupy a number of buildings on the site, each focused on a specific business activity. 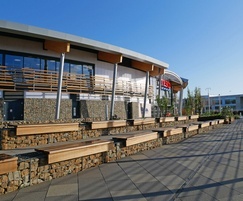 Originally designed and laid out predominantly for cars, recent improvements have been made to make the grounds of Shire Park more user-friendly for pedestrians, creating outdoor spaces in which to relax and to create attractive walkways between the various buildings and facilities on the site. The forecourt of Tesco’s Checkout Building is one such example, with the car park and vehicular route reconfigured to provide a larger paved apron to the front of the building. Small planters have been provided to green up the space and extensive new seating installed. Furnitubes’ Ribbon bench – with its under-stated elegance and simplicity - was selected for the scheme with 16 benches supplied in 3 different lengths, to suit the spaces available. 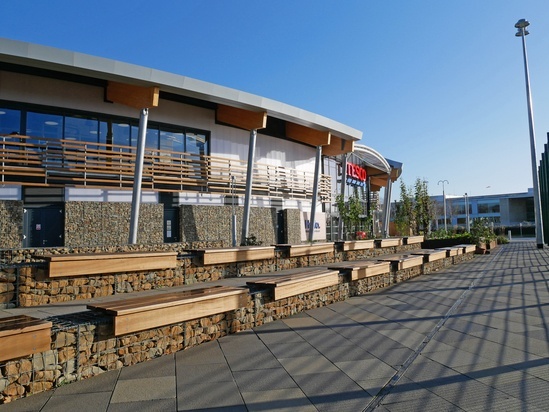 A newer development at Shire Park is the Heart Building, designed as a focal point for Tesco’s staff, customers and suppliers to meet and collaborate. Alongside the building is a multi-use games area for staff to use during their lunch breaks and after work, all set in new landscaped surrounds. Overlooking the pitch is two-tiered gabion linear wall structure that provides an elevated position from which to watch the activities on the games area. Although simple to construct and attractive features in their own right, gabions aren’t particularly comfortable to sit on, but the addition of Furnitubes’ Lapa benches readily converts the wall into useful seating provision. 16 Lapa benches were supplied in total, providing seating capacity for around 50 people.